Even in his homeland, Esteban Rojas never celebrated Valentine's Day. But if he wanted to now, since arriving six years ago in Bridgeport, he'd be missing something -- his wife still lives in Mexico. When he can, the 53-year-old Rojas sends money to her, his two children and parents. In warmer months, he landscapes in Fairfield, Southport and Westport. In winter, he shovels snow. Lately, times have been tough. "No mucho business," he said Tuesday, standing on the snowless Post Road sidewalk, beside four buckets of unsold merchandise and two buckets that were crushed. Across two lanes of traffic, on the island of stores, the restaurant Señor Salsa reminded him of Mexico. When he got dropped off here about noon, he hoped to sell enough roses to pay his rent and grocery bill. Across two more lanes of traffic, though, Splash Car Wash reminded him of what he got instead. Greg Jenson picked up his '07 Nissan Maxima at lunchtime Tuesday from the Miller Nissan dealership. The senior political science major at Fairfield University had his taillight and undercarriage fixed. Then he drove straight to get his car cleaned. "Splash is my go-to cleaner," he said later. "Clean the outside and inside. Can't beat it for 20 bucks." He added: "I'm still going to go back there." Handing over his keys, he stepped inside and enjoyed a Snapple. Watching through the windows, as cars with clean interiors lined up to head into the machine-wash hut, he saw something shocking. "I just see my car zoom by," he said. "My initial thought was: `Geez, it's stolen. Someone took my keys.' "
He ran outside and watched as people chased after it into traffic. He learned that no one was inside -- that an employee moving the car behind his had accidentally bumped it, sending it at maybe 10 mph into four lanes of traffic -- pointed right for a Mexican man trying to sell roses. The car eased across the westbound lanes, threaded through the turning lane, and crossed the eastbound traffic unscathed. Then it climbed the curb, sideswiped a utility pole, chopped off the side-view mirror and stripped lots of paint. It also steamrolled two buckets of flowers, scattering Rojas. 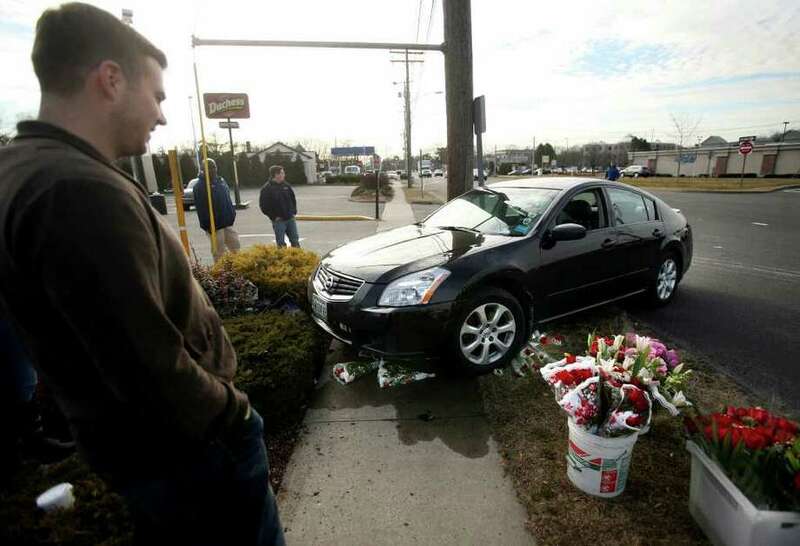 The damage was this: three $25 bouquets of roses, two $3 roses, and perhaps $2,000 of just-repaired Nissan Maxima. When the police left, Jenson steered his car back to the dealership. "A Valentine's Day massacre," he said. If love is patient and kind and not easily angered, then Rojas can probably do without Feb. 14. On Valentine's Day two years ago, he took home several hundred dollars selling roses. But by twilight Tuesday, he stood amid a scattering of rose pedals, unromantically. Four buckets of flowers remained unsold. He noted his competition in the Bob's parking lot, a half-mile west, and his other competition in the parking lot across the street. He figured he'd take home $50. "Everybody don't have money," he said. In March, he said, the landscaping will start again. He'll pick up sticks, cleaning up winter's wrath. He'll lay fertilizer, plant flowers and mow lawns. He's hoping it won't rain much; he might get to send some money home. And even today, he could be thankful for something. "You're lucky you didn't get hurt," said Dennis Docimo, just off work at Goodyear Auto Service Center, which is located across the street beside Splash. Docimo picked out a bouquet of purple roses and handed over $20. Returning to his car, about to head home to his wife, he couldn't shake one thought. "What if he was looking the other way? It could have taken him out." The sun setting, Rojas scanned all directions for another approaching car -- his ride home. "No more customers," he said. "A couple more minutes and `Hasta la vista.' "